As usual, as this blog serve to archive everything related to my personal & fandom event, I’m adding the above pics as one of my best memoir in fandom. Yes!!! !….T-MAX leader, Shim Minchul oppa reply my tweet….kyaaa…LOL tho he only reply the above (plus typo in his facebook add…lol)…yet I’m still a very happy fangirl..weehee. And yes…I’m really big fan of T-Max, and this is one of the group I really want to see them performing live. To record, I also have their autographed ‘Born To The Max’ album. I actually plan to buy all their album as collection, but for now I only have Born To The Max, The Single Collection & Boys Over Flower OST Special Luxury album..kekeke. 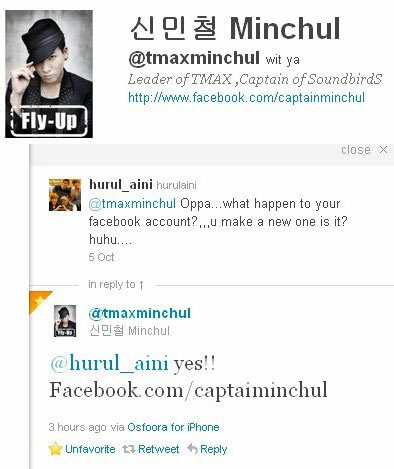 Actually, previously Minchul oppa adding fans to his personal FB account. I even list him as my brother and he approved it (sob sob…i should keep a printscreen of that!!). He closed that account, and now sharing news to fans via his Facebook Pages. But I’m glad coz he share a lot of pic there, including recent picture of KimJun-oppa & YunHwa-oppa in army. Oh yeah…he will come out with solo single/album soon…can’t wait….weeehooo.